If Firefox is the fully loaded SUV of the browser world, rumbling along laden with bells and whistles, Camino—based on the same rendering engine, but customized specifically for the Mac—is the stylish yet stripped-down sports coupe. It won’t give you the plush features or thorough customization that Firefox offers, but it compensates with speed. On my iMac G5, Camino 1.5.5 rendered a set of test pages nearly twice as quickly as Firefox did, and in slightly less time than Safari. The application itself didn’t load quite as speedily: In my testing, it took between three and seven seconds for Camino to launch, compared to three to eight seconds for Firefox, and one to three for Safari. For the most part, Camino generally renders pages beautifully, but there are occasional glitches. On YouTube.com, for example, a movie widget that loaded fine on Safari and Firefox appeared as a blank space in Camino. On Gap.com, a “Quick Look” window that opened above a Flash animation flickered, and wouldn’t fully display its top edge. Camino also inherits Firefox’s tendency to stall for several seconds when opening many tabs simultaneously. 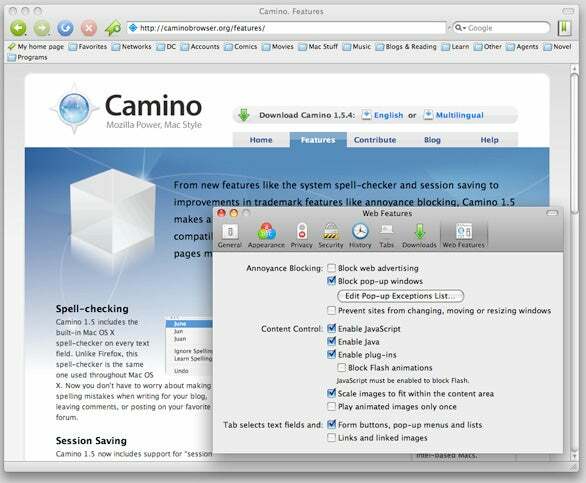 Although Firefox has a Mac version, Camino is the open-source Mozilla Project’s Mac-specific showcase. Its friendly, thoughtfully designed interface runs a close second to Safari’s for ease of use. It’s got one-click, same-window access to bookmarks, built-in Google search, a customizable toolbar, and integration with OS X’s spell checker. Handy “annoyance blocking” options let you prevent sites from resizing your browser, block Flash animations, and limit the number of times an animated GIF will loop after loading. Some users may even prefer Camino’s friendly, colorful navigation buttons to Safari’s tiny gray boxes. Annoyance Blocking: Camino’s preferences make it easy to zap all sorts of Internet aggravations. Unfortunately, unlike Safari and Firefox, Camino doesn’t offer a built-in RSS feed reader; it must pass off RSS feeds to another newsreader, which you need to specify. Camino also doesn’t support Firefox’s array of extensions, themes, and customized search engines. Nor will it let you drag and drop tabs to reorder them, as Firefox and Safari do. And Camino lacks built-in Help files, linking instead to helpful online documentation. If you value speed and superb design above all else, and you don’t need Firefox’s flexibility or Safari’s RSS reader, take Camino 1.5.5 for a test drive. What it lacks in fancy features, it more than makes up in snappy performance and style.